Also includes some information about later expeditions. In the 1880s British concerns were raised by contacts between the Burmese and the French whose colonial expansion in Indo-China had reached the Burmese border. When a British company was fined by the Burmese for contraventions of its teak extraction contract, the British demanded arbitration and, when that was refused, issued an ultimatum which would have reduced Burma to a vassal state. When this was not accepted on 9 November 1885 an invasion force under Maj-Gen Harry North Dalrymple Prendergast was sent up the Irrawaddy. By 26 November the envoys from King Thibaw offered to surrender. Thibaw was taken into exile in India and the British annexed the remainder of Burma on 1 January 1886. Increasing numbers of troops were required to counter the resistance campaign which continued into 1889. Unrest continued in the northern tribal areas. See Chin Lushai Expedition 1889, Chin Hills Expedition 1892, Kachin Hills Expedition 1892 & Kachin Hills Expedition 1895. 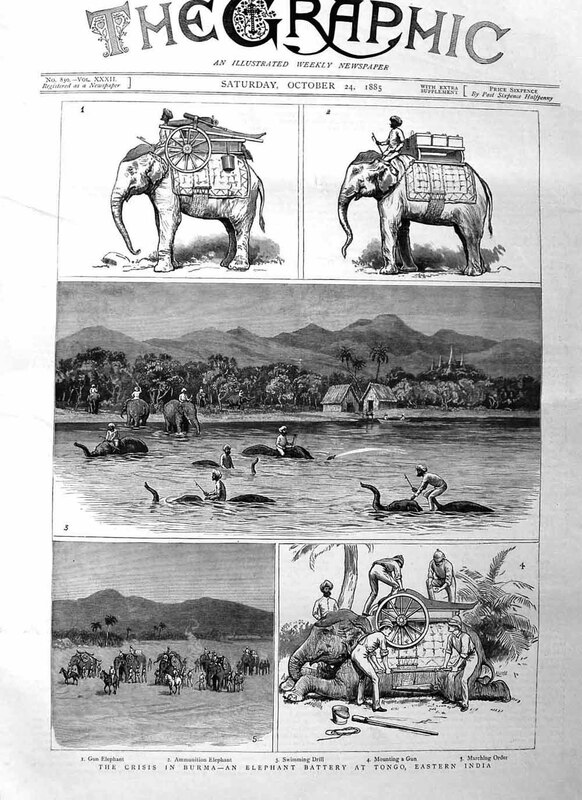 IOR/L/MIL/17/19/30 Proceedings of the Government of India Military Department: Burma 1885-86. 460 pages. Calcutta, 1886. IOR/L/MIL/17/19/32 Supplement to the Third Burmese War. Diary of events. Lt Henry Ernest Stanton. Calcutta/Simla: Intelligence Branch, QMG's Dept, 1888-93. 3 volumes + index volume. Some volumes are available online, refer below, but most are restricted to viewers in areas such as North America etc. The is however, one volume viewable without restriction. Digitised images of the Burma military campaigns of 1891/1892 taken by the official photographer Felice Beato, who escorted the army. British Empire & Commonwealth Collection catalogue reference 2003/001/001 Bristol Museums. Britain’s Wars in Burma (1824-1946) by Ross Dix-Peek. Lists the regiments taking part. 1st, 2nd, 3rd Burma War. History of the Third Burmese War, Diary of Events: Period 2 (Suppl.). From 1st April 1886 to 30th September 1886 Google Books. This seems likely to be one of the four volumes which form IOR/L/MIL/17/19/32, mentioned above, by Calcutta/Simla: Intelligence Branch, QMG's Dept. History of the Third Burmese War [1885-1891]. The official history of the third Burmese war compiled in the Intelligence Branch of the Quarter-Master-General's Department in India consisting 4 volumes and 2 index volumes online. Restricted viewing, available to North American etc viewers. HathiTrust Digital Library. "The Third Burmese War" Chapter IV, page 82, Burma under British Rule - and Before, Volume I by John Nisbet, late Conservator of Forests, Burma 1901 Archive.org. "Field Operations, Burma" London Gazette November 15, 1889 page 6057. Covers the period 31 March 1888 to 31 March 1889. The Pacification of Burma by Sir Charles Crosthwaite. Chief Commissioner of Burma 1887-1890. 1912 Archive.org.This edition which has illustrations, is missing the first page of the Preface which may be viewed in an alternative edition. Record Of The Service Of The 23rd Bombay Light Infantry During The Campaign In Burma, From July 1886 To May 1888 by W A M Wilson. Pdf download, Digital Library of India. Archive.org version. The Life Of General Sir Harry N.D. Prendergast by Henry M. Vibart 1914. Pdf download from the Digital Library of India. Archive.org version. Sir Harry led the 1885 expedition. “A Naval Officer on an Indian Army Staff” by G. A. B. The Naval Review May 1938 Vol XXVI Issue no 1, pages 75-85 and Issue no. 2, pages 271-282. Part 1 (scroll down) and Part 2 (scroll down), now archived pages. During the Burma river war of 1885, the author, G. A. B., was appointed naval aide-de-camp to General Prendergast who was in command. The Annexation Of Upper Burma by D P Singhal 1960 Archive.org, Digital Library of India Collection. This page was last edited on 19 March 2019, at 09:53.